Mother's Day Brunch at The Chimney House! For our brunch events, we specifically order sunshine and blue skies - because our beautiful Sheffield venue looks so totally wonderful in the morning with the sunlight streaming through our windows - and we want to share all that delight with you! Brunch at The Chimney House on Saturday 25th March (the day before Mother's Day) was the perfect opportunity to treat mum (or yourself!) to a luxurious morning of being totally looked after... fizz, flowers and feasting - it doesn't get any better than this. Arriving in the spring sunshine at The Chimney House, our guests found their seats in our candlelit meeting room - nameplace written in calligraphy on luggage tags, sprigs of lemon thyme on their linen napkins and tables full daffodils with of happy bright yellow faces. We think a horseradish Bloody Mary (spiked with a slosh of gin or two on request) - and couple of drops of tabasco and Lea & Perrins - is the perfect way to start brunch. 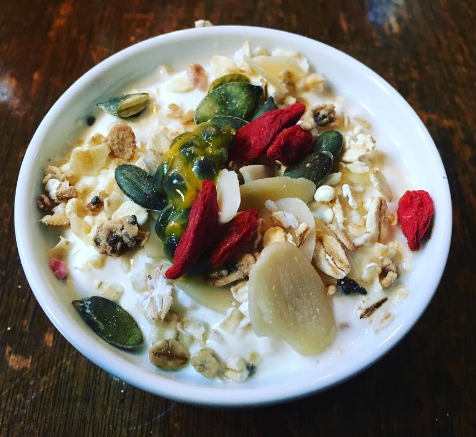 Our first foodie course was overnight rhubarb soaked oats, with toasted coconut yoghurt, passionfruit and quinoa crumble - sprinkled with almonds, goji berries and seeds - out of this world! With freshly brewed coffee, Yorkshire Tea and a fair few bottles of fizz flowing - our guests grabbed a newspaper and truly settled in for a delightful morning. "Fantastic brunch! Staff looked after us so well - feel proper spoiled! Thank you for a perfect relaxed Saturday!" "The loveliest afternoon I've had in a long time"
Our dreamy space, and 20ft feasting tables create such a wonderfully relaxed atmosphere, with guests making new and unexpected friends with their neighbours, sharing a glass of fizz or two, and chatting to like-minded interesting table mates. Being passed between new friends was a neverending pile of the freshest just-toasted Seven Hills bread, Maldon salt-spiked pats of butter and sticky jams to indulge in. Mountains of seeded-sourdoughs, crisp-crust pagnotta, doughy overnight bloomers and fig & fennel loaves were demolished with zeal! "A perfect afternoon, had a lovely tasty brunch, staff friendly and a wonderful atmosphere. How the tables are set made us new friends too! Perfect, thank you"
Then came the toughest choice of the day, the most taxing of late-Saturday-morning problems; luxury sweet potato and chorizo bubble & squeak, with poached eggs, silky wild garlic pesto, vine roast tomatoes and a dollop of ricotta OR French toast with maple home-cured streaky bacon, sticky maple syrup, homemade fruit compote and cinnamon cream - an almost impossible decision to make! Fear not, because delighted contented sighs and happy silences abounded - whichever delicious option was plumped for! And because all feasts should finish with pudding (even if they are the first meal of the day!) our guests were treated to boards of gorgeous petit fours; marmalade pates des fruits, white chocolate coated buttery fudge, creamy chilli chocolate truffles and cinnamon Portuguese custard tarts - brunch bliss! "Stunning brunch. What a lovely start to the Mother's Day weekend." Heartbreakingly, all good things have to come to an end. Once our guests had polished off the last crumbs and sipped the final few drops of fizz, they wandered happily blinking back into the sunshine-soaked cobbles - light bouncing off the water - clutching bunches of daffodils we'd presented as a parting gift. Until next time! If you'd like to be first to know when we announce our next dreamy dates - drop an email to info@thechimneyhouse.com and we'll keep you up to date. "So enjoyed the delicious brunch. Thank you for your attention to detail and the friendly staff. They made it perfect!"